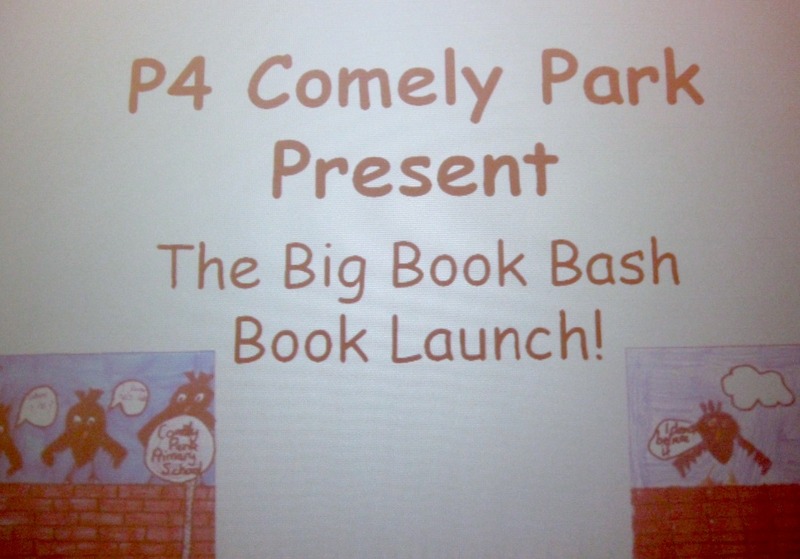 On Wednesday, 27 November the P4 classes at Comely Park Primary held a gala event to celebrate the launch of their newly published Gallus and Hooley books, Trouble Bruin and Castle Catastrophe. It all began with a powerpoint presentation showing the long and involved process of writing the books. 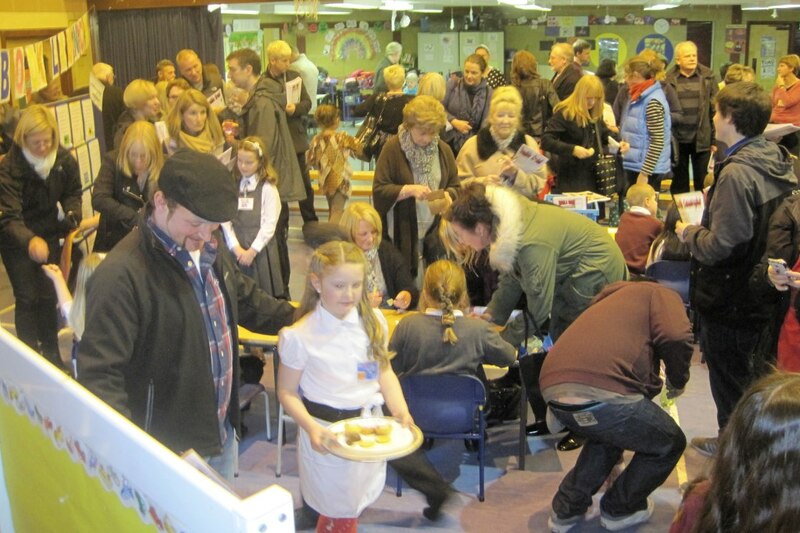 A huge audience of P4 parents, grandparents and friends learned how the children had started with their main characters, Gallus the craw and Hooley the hoolet. They had thought carefully about these two characters, making a long list of words to describe their personalities. Gallus is clever and mischievous, and Hooley is silly and likes to have fun. With this in mind, the children began to think up storylines for the books they were going to write. Next, I was invited to come and do a bit of “brainstorming” with the P4 classes. We had great fun talking through all the brilliant ideas they had for what kind of trouble Gallus and Hooley might get up to! They even let me play with the fuzzy black Gallus puppet and the little grey Hooley owl so we could act out some of their ideas. The powerpoint presentation then went on to show how the children produced a rough storyboard of each story, working out how the text would look on each page and deciding who would do which illustrations. Judging from the finished books, this was a great deal of work! 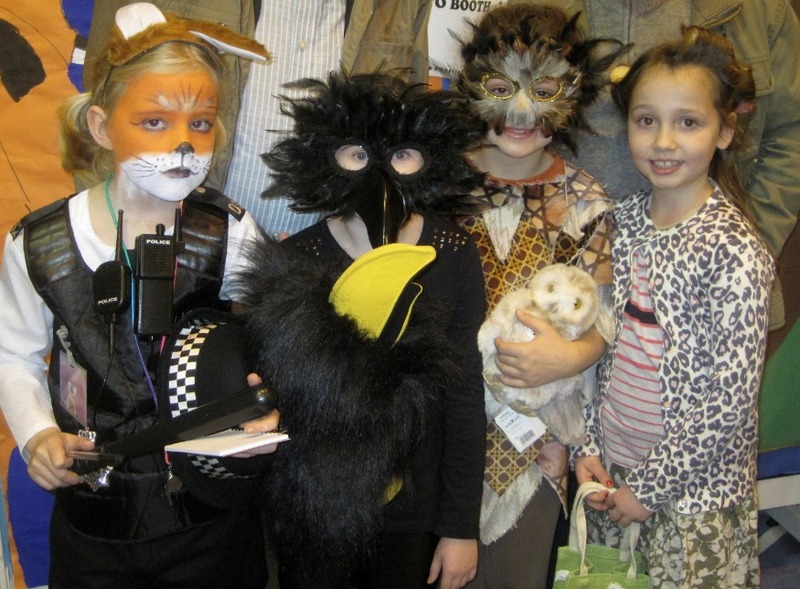 Four children were dressed as the main characters from the stories: Officer Tod, Gallus the craw, Hooley the hoolet and a little old lady. After the powerpoint presentation, a big group of P4s sang the “Four craws sittin’ on a wa” song, to the accompaniment of a very talented young clarinetist. Lots of children were wearing costumes, including the four above. 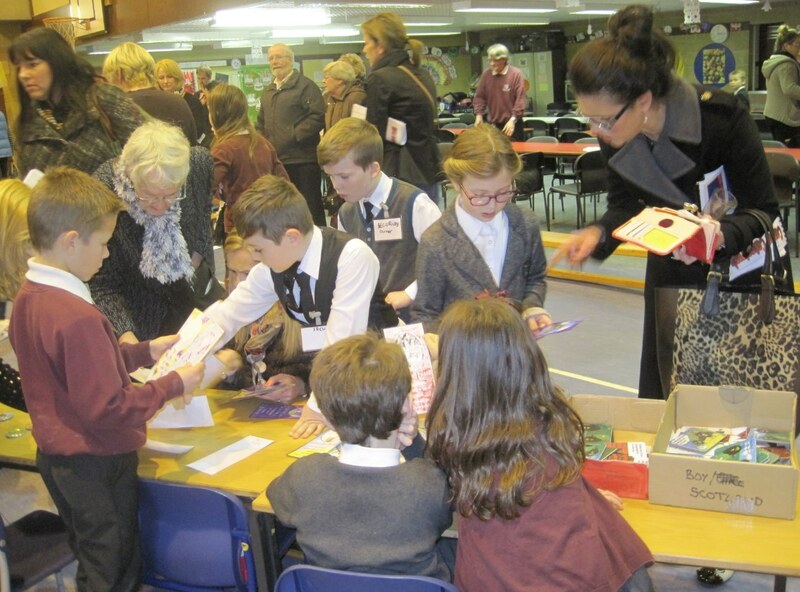 There were others in charge of security in their smart suits and sunglasses; those on hospitality duty milled around the crowd offering sparkling drinks and delicious nibbles; and other children were in charge of stalls where parents and friends could buy badges and bookmarks or get their copies of the two books signed by the authors. 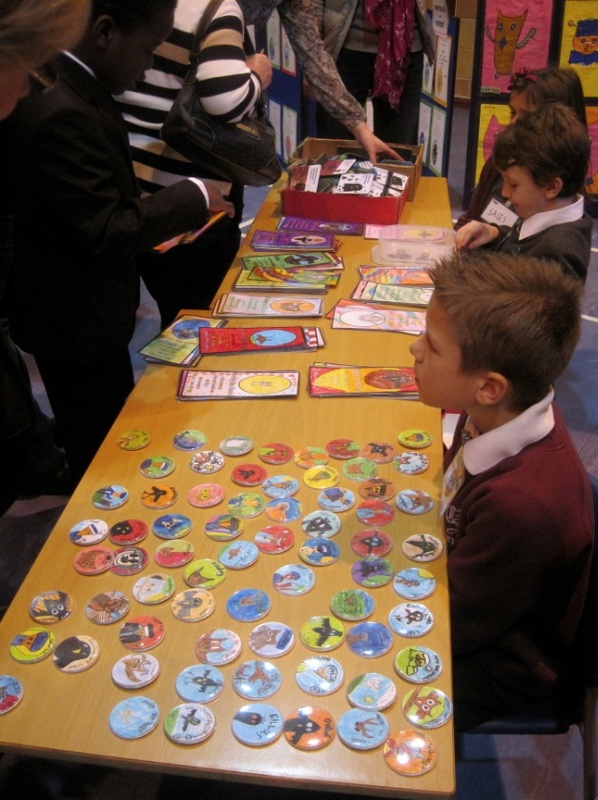 The children had made a colourful array of badges and bookmarks on the Gallus and Hooley theme. Most of them were snapped up! Gallus coasters in four designs were very popular. One author looks quite worn out after all the signing! In addition to their excellent book illustrations, the children made colourful Pop Art portraits of Gallus and his friends in the style of Andy Warhol. And just look at the crowd! There was a very good turnout at the event, and the books were soon sold out! 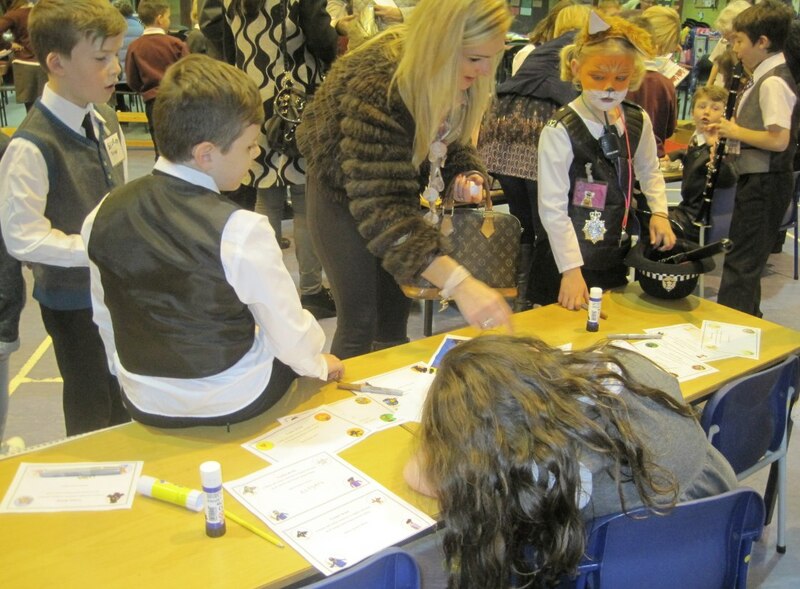 The drinks and nibbles were much appreciated, and everyone had a brilliant time. 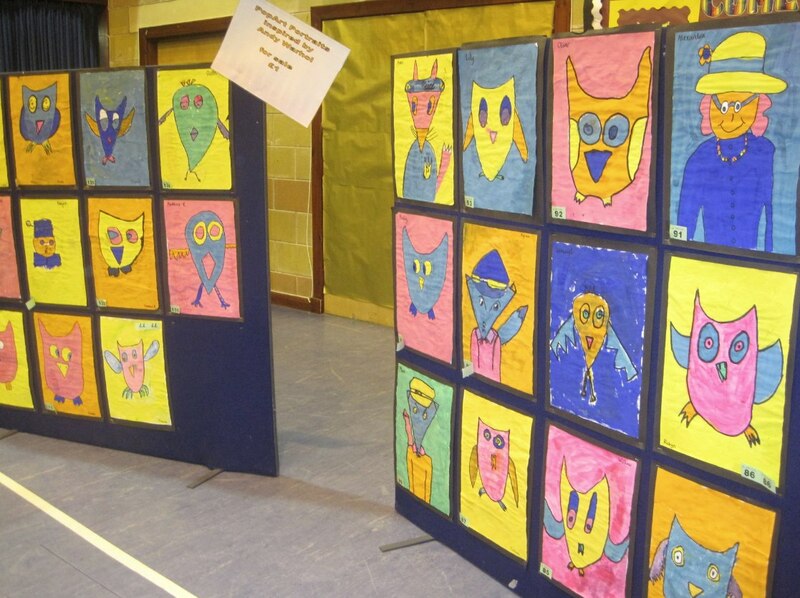 Special thanks must go to Miss Katrina Lucas who had the initial inspiration for this excellent literacy project. To produce two bilingual books (in English and Scots) with full colour illustrations was no easy feat, and the P4 classes have risen to the challenge brilliantly! Congratulations to everyone! Thank you very much for attending our book launch. We hope you had a terrific time – and thanks for making us famous! Thanks for inviting me to the launch! It was a pleasure to be there and I thought the event was a huge success. Merry Christmas and Happy New Year to all of you, and I look forward to seeing you again in the new year. It was, wasn’t it? Glad you enjoyed it! Hope to see you all again soon!